At least seven people, including four suicide bombers, have been killed Monday in the northeastern Nigerian city of Maiduguri, police said. Following the deaths of three suicide bombers Monday morning on the outskirts of the city, another blew up himself up, killing three people in Mainari Kanuri village, also in the city's vicinity. 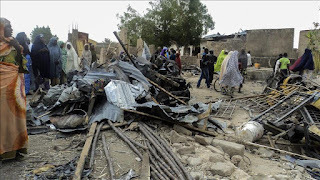 "Another suicide bomb incident was foiled at Mainari Kanuri village along the Damboa/Biu road on the outskirts of Maiduguri," police chief, Damian Chukwu told Anadolu Agency. "A suspected Boko Haram [member] disguised as a cart pusher was intercepted by residents of the community. He detonated the IED in his cart, killing himself and three nearby civilians, while two other civilians sustained injuries," he added. An hour earlier, a female suicide bomber, attempting to sneak into the city, detonated the bomb strapped to her body early Monday morning, killing herself, police chief, Damian Chukwu told Anadolu Agency in a telephone message. The two other suicide bombers, who were also trying to enter the city, were gunned down by security personnel at the checkpoint in Mamanti, on the outskirts of Maiduguri, Damian explained. "Three female suicide bombers attempted to enter Mamanti village [...]. They were intercepted by the Civilian JTF [vigilantes]," he said. "In the process, one of the bombers detonated an IED strapped to her body killing herself alone.The other two tried to escape but were shot dead by security personnel on duty." Nobody has claimed responsibility for the botched bomb attack but police said it bears resemblance to similar attacks perpetrated by Boko Haram, the group that has carried out nearly seven years of violence including suicide bombings in northern Nigeria. President Muhammadu Buhari has vowed to put an end to Boko Haram violence in Africa's most populous nation.